If you are of the persuasion that every fish that is caught should be released, you may not want to read this article. 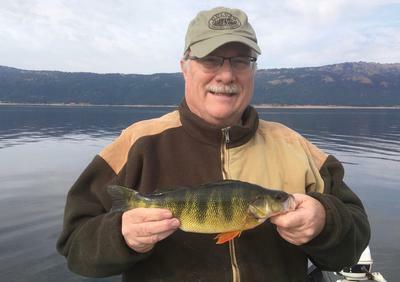 Once or twice a year, I have the opportunity to go to Cascade Lake and fish for perch. Cascade Lake was planted with perch soon after the dam was constructed, so it is an introduced species in an artificial lake. Thirty years ago the fishery at Cascade was basically dead. 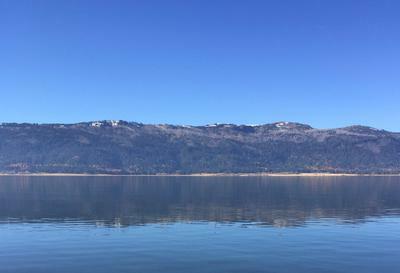 Idaho Fish and Game did a massive restoration project that included keeping the perch. 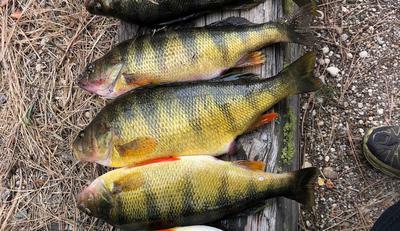 It is now one of the most productive perch fisheries in the United States. Fish and Game monitor this lake very closely. With the present population, they are encouraging people to generously harvest the fish. They don't want the over population and stunted growth of the past. Yesterday the only fish we kept were between 14 and 16 inches. It was a beautiful day, sunshine and no wind! The group I fish with all use dropper weights and Mr. Twister set-ups on 6-7 foot rods. I was razzed a little when I pulled out the Tenryu Rayz Spectra RZS51LL fitted with the Shimano Cardiff CI4+ 1000SHG and 4 pound test line. On the business end I used a C'ultiva JH-85 Jig Head 1.7g and a Eurotackle Micro Finesse Curlypede White. 8 inches above, I used two BB split shot. Kyle, the guy who lives at Cascade and was our unofficial guide, said "You will only catch little ones on that rig, if any at all." We got to the first place to try to fish. Geoff, my fishing partner dropped his rig, and he had a fish on before I had finished putting on my bait! I dropped my rig to the bottom, and wound up three turns, one jig and I had my first fish on! Three more fish in less than 15 minutes and Geoff was re-rigging. He mimicked my rig as close as he could and began catching fish. We were on the water for less than 4 hours. I caught 52 fish and Geoff caught 17. Finesse fishing is not only more fun, it is way more productive. With the Spectra, I could detect the subtle takes much better than Geoff! This is the first rod I have owned where I could feel the take when they took the bait on the drop! On the depth finder, I could see schools of perch that where a large massive ball of fish! On about 20% of the fish, I closed the bail and set the hook when it had only dropped 6 feet. We were fishing in 18 feet of water. Some lessons learned on this trip. Don't let your friends who don't fish with finesse gear unhook your fish. Geoff bent my jig by horsing the hook off with his forceps. I had to re-rig. As much as I enjoyed the ability of my rod to detect strikes, I wish I had a longer rod for fighting the fish. I am being picky here, but I know I would have enjoyed the fight more with a 6 or 7 foot rod. I will be in the market for a "Lake" rod soon. With the sensitivity of the rod, I didn't have any fish swallow the hook. Almost all were lip hooked. Poor Geoff wasn't so fortunate! Most significant, is I really enjoyed the battle of every fish! Every twist and turn of the fish was felt. I looked across about 30 yards and watched Kyle and Kelly fish when I took a break. With their heavy equipment, they were just "hauling in" fish. I learned yesterday that finesse fishing is more productive and a lot more fun! Perch from Cascade Lake are not only big and fight well, they taste good! It is tough to beat the light flaky fillets. I kept 31 fish. We are in for some very nice meals over the next couple of months. I used to live in Wisconsin and my dad & I fished perch off the Lake Michigan piers with what was called a rubber band rig. Best eating fish around. Those are some really nice fish, really nice fish! I enjoy finesse fishing as well. I get into nice bluegill and their cousins, as well as trout. I can never find perch consistently. My best luck is from the ice. Those are some big perch! We got some down here in New Mexico in a lake called Eagles Nest. They are also being planted in some of the other lakes nearby. Not quite the size you are getting but ours have been improving. I measured several in the 10" range from our last outing. This year I used an ultra lite bait finesse rock fish rod. Once I dialed in the soft flexible solid tip was sensitive enough to feel the strikes and my hookup and landing ratio was way above the others with their stiffer tip rods. Also like you said I had way less deep hook issues. I'd like to finish with...I don't usually comment to blogs but I like this one and I relate to all you anglers who are willing to think outside what's considered an American market normal box. There's so much more to angling once you step outside of our mainstream. Can’t believe I didn’t know or hear about this fantastic fishery when we lived in Twin Falls, Idaho. I think perch are one of the best tasting fish along with crappie and walleye. The biggest advantage to the use of xxl equipment and 2# test is be able to cast very lightweight jigs and get them to the bottom. I’ve yet to catch a fish too large for the equipment. Am finding that there are more and more "many" fish days than previously and I contribute that totally to downsizing to extra ultralight equipment.